Keith Leonard Sutherland was born in Melbourne on 17 January 1916 and educated at the Melbourne High School. From an early age he dedicated his life to science. He graduated BSc (1938) and MSc (1941) with distinction from the University of Melbourne where he soon exhibited his remarkable intellectual capabilities, not only in science but in other activities as well. As a first year student he decided to take up chess. With his usual abounding energy he studied the game thoroughly over the summer vacation and the following year was the University Chess Champion! In 1948, he was awarded his DSc by the same University and his PhD in 1950 by the University of London. On the completion of his BSc in 1938 Sutherland joined a small research group in the Chemistry Department, University of Melbourne. This group, working on mineral flotation and supported by several mining companies, was already eight years old when Principles of Flotation by IW Wark appeared in 1938. This monograph contains the first published references to Sutherland’s work on flotation. In the years that followed, Sutherland made an impressive contribution in this field which culminated, in 1955, in the publication of a revised and enlarged version of Principles of Flotation with Sutherland and Wark as joint authors. In their turn the two versions of this book were accepted worldwide and remain the major statements on the scientific basis of froth flotation. Translations appeared in Russia and Japan. Details of the research carried out by Keith Sutherland at CSIR/CSIRO can be found in the 1981 biographical memoir written by WE Ewers and DE Weiss available by following the link in the Sources below. the separation of ergot grains from healthy rye grains by a novel flotation method. With regard to the last project, the wartime shortage of ergot for medicinal purposes called for local production commencing with the separation of black ergot grains from healthy rye grains. The traditional, but hardly acceptable, method used discerning poultry to select the healthy rye and spurn the ergot. Sutherland and Enid Plante devised a novel flotation method based on a limited selectivity enhanced by oiling the rye grains. They used a pneumatic flotation cell to avoid the turbulence of the usual impeller-agitated cell which would have disrupted bubble-grain attachment. The result was a flotation separation of these very coarse grains, which was visually spectacular and quite extraordinarily efficient. Both recovery and ‘purity’ of the ergot exceeded 95 per cent. dynamic phenomena in flotation, both in the mechanics of bubble-mineral attachment and in the time-dependent adsorption phenomena at the air-water interface. His 1945 paper Kinetics of Flotation is still widely consulted and quoted; it reveals a flair for mathematical analysis. He examined the hydrodynamics of collision between bubble and particle in a flotation cell, and developed an equation for flotation rate in which the important variables were the sizes of mineral particles and bubbles and the ‘induction period’, which is defined as the period needed for colliding particle and bubble to remain in contact before stable attachment is achieved. the variation of the surface tension of solutions with time, a topic on which he was subsequently to work with Sir Eric Rideal in London. I Brown’s work on vapour liquid equilibria. contributions to the chemical engineering literature on mass and heat transfer from solid spheres into fluid in laminar flow. Physical Chemistry came to be interpreted very widely in the activities of Sutherland’s group. When CSIRO was asked by its Minister, the late Lord Casey, to consider the possibility of working on bushfire control, Sutherland called a meeting of his senior colleagues to consider what might be done. This meeting is well remembered by those who took part in it; the topics discussed ranged from the aerodynamics of bushfire movement to the chemistry of flame propagation, fire-proofing agents and radiation shielding. Sutherland established a team around AR King and research was quickly underway. The results of this work had far-reaching consequences in techniques of forest management, including control burning and the measurement of fire hazard, in identifying the nature of hazards to personnel and advising safety procedures, and in a more detailed understanding of the physics and chemistry of bushfires. King and Sutherland wrote one paper together, on felling trees with explosives. It was largely Sutherland’s influence that made his Section an exciting group to work with; there was a wide range of interests, a tradition of talking to one another about ideas and progress, and a continual state of friendly controversy. Sutherland was in the thick of it, arguing his view with vigour. He was tenacious but also flexible; the next day he would be back arguing just as strongly but sometimes from the other side. His colleagues admired his ability to change his mind; rarely did he have to, but when he did the matter was close to being resolved. 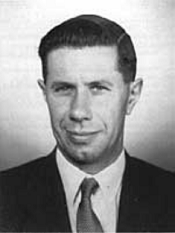 Sutherland’s group ceased active work on flotation in 1955 and LF Evans and RB Head transferred their attention to the physico-chemical aspects of ice nucleation, associated with the cloud-seeding program of the Division of Radio physics. Out of this came a collaboration between Head and Sutherland. They showed that, although the number of nuclei is decreased by aggregation, the aggregates are more effective in the sense that, on contact with super-cooled water droplets, they cause ice to nucleate at higher temperatures than will unaggregated nuclei. Sutherland shared with many Australian scientists an interest in water as a resource, an interest which ran as a major theme through his own work and that of his group in the projects on evaporation control, ice nucleation and Weiss’ early work on desalination as discussed above. Among his colleagues Sutherland was talking in the 1950s about the calculations he was making on the feasibility of towing icebergs from the Antarctic as a source of fresh water for Australian cities. The same interest found him in 1959 collaborating with officers of the Snowy Mountains Hydroelectric Authority on the new method for determining calorimetrically the quality of snow. In 1956, Sutherland was designated as Assistant Chief of the Division of Industrial Chemistry and two years later, when the Division was reconstituted as the Chemical Research Laboratories, he became the first Chief of the Division of Physical Chemistry. He remained in that position until he was appointed Director of Research for the Colonial Sugar Refining Co Ltd in 1959. Keith Sutherland held the position of Director of Research in CSR Limited from his appointment in November 1959, until his retirement on his 62nd birthday in 1978. The Colonial Sugar Refining Company Limited (now CSR Limited) in the 1950s was a major sugar miller and refiner with substantial interests in building materials and chemicals. It had a long history of scientific investigation into its raw materials and products. Sutherland had frequently been consulted by CSR prior to 1959 when he was invited to join the Company as Director of Research in Sydney. At that time CSR had a central research department with about twenty-five graduates and a support staff of thirty. It was characteristic of the man that, in joining a major manufacturing industry with a long history of competence in relatively simple technologies, he saw an opportunity to develop a research group that would be a world leader in scientific achievement. His vision began to take substance with the construction, in 1962, at Roseville, Sydney, of one of the very few industrial research laboratories in Australia. This provided modern accommodation and advanced instrumentation for an eventual staff of more than 150, including about fifty graduates. A wide range of disciplines was represented: chemistry, physics, engineering, mathematics and analysis. His appointment quickly brought about a sharp change in the type of research project being undertaken by the laboratory. Up to that time most of the projects had been initiated because a particular factory or unit of the Company encountered a problem that had to be solved. The projects were characterised by being strictly concerned with current Company activities, though many of them were long-term, requiring years of research and investigational work. With Sutherland as Director new projects were generated. Many of these were aimed at gaining a better appreciation of the fundamental scientific basis of the processes and products of concern to CSR. Others were speculative long-term ventures aimed at generating new areas of activity for the Company. Details of the research carried out during his tenure at CSR can be found in the 1981 biographical memoir written by WE Ewers and DE Weiss available by following the link in the Sources below. The history of Australia throughout the 20th century is studded with the exploits of men of vision and future historians will see the two latest decades [1960s and 1970s] as remarkable for the new industrial initiatives that have come from such men. In the scientific field, through his role in CSR, Sutherland was one of those modern visionaries contributing to the thread of science and technology that has itself played an important part in the company’s growth and development. Although a dedicated physical scientist he built up a shell collection of world importance which led to his becoming first Honorary Curator in the malacology department and later a Trustee of the Australian Museum in 1966 and President of the Board of Trustees from 1972 to 1974. In honour of his contribution the Trustees of the Australian Museum established in January 1980 a Keith Sutherland Award. In a related area, as a member of the Board of the Lizard Island Research Station, he helped to facilitate and promote the important contributions that scientists working at that Station have made to the ecological studies of the Barrier Reef. Within the Academy of Science Sutherland became known (along with his lifelong friend and mentor Ian Wark) as a voluble and persistent advocate for a change in Council’s attitude towards applied science and applied scientists. It is fair to say that at the time of his death he was deeply disappointed by the policy of the Academy on this matter. However, being a realist, he recognised and accepted defeat and joined, reluctantly but actively, the group setting up the Australian Academy of Technological Sciences. He was one of the twenty-seven scientists and technologists who accepted the invitation of the convening committee of six to a meeting in Melbourne on 3 July 1974 to discuss the formation of an academy of technological sciences. At that meeting he was appointed to what became the foundation council of the academy when it was formally established in November 1975. He served until October 1977 as first convener of the Membership Committee and was most active in establishing mechanisms and by-laws for the election of Fellows. His suggestion that the academy prepare an annual review of the progress of technology in Australia led directly to the reports on Innovation in Australian Technology. His greatest contribution to the Academy of Technological Sciences was, however, the Report of an Enquiry into the Effect of Australian Design Rule 27A for Control of Vehicle Emissions and Future Control Measures (1979). In 1978, the Academy was asked by the Minister of Transport, the Honourable PJ Nixon, to report on vehicle emissions and it set up a committee consisting of KL Sutherland, convener, CS Christian and RI Tanner. The degree of co-operation which the committee received from the industry was due in a large part to Sutherland’s powers of persuasion and its objectivity due to his resisting many of the pressures to which the committee was subjected. Appointed as Chairman of the New South Wales Science and Technology Council on its formation in 1975, he served both major political parties. Chosen because of his acknowledged leadership in professional circles, he advised on co-ordination of the results of major scientific studies by various departments, and the Premiers of the day have valued his advice over wide-ranging fields of science and technology. In the federal sphere Sutherland was appointed in 1978 one of five part-time members of the Australian Industrial Research and Development Incentives Board. His intimate knowledge of R&D in Australian industry and his broad knowledge of the Australian chemical, engineering and manufacturing industries ably fitted him for this assignment. Here again he was ever ready to make his scientific knowledge available over a broader field. In 1970 he led, at the request of the Australian Government and with the blessing of CSR, an official delegation to the UNESCO Meeting on Multidisciplinary Research in South East Asia held in the Philippines. This was followed in rapid succession by organisation of a UNESCO Seminar on ‘Assessment of Research Projects’ in Djakarta and involvement in a UNESCO project ‘Integrated Research Planning in Indonesia’. In all Sutherland carried out three missions in Indonesia concerned with policies in research, science and technology. In 1977, he was invited by UNESCO to advise the Secretary-General of the National Economic and Social Development Board of Thailand. Sutherland’s advice was sought on overall selection of resource allocation into research for agriculture, industry and social fields. He thrived on this type of exercise and did it extremely well. Never have I had a more agreeable colleague. I had a great affection for him and held him in the highest esteem. Today we mourn our great loss but it is of Keith’s accomplishments that we must think and give thanks to God for his time with us. After Sutherland’s death, the Australian Industrial Research Group suggested to the Academy of Technological Sciences that the academy would be an appropriate body to commemorate him by the establishment of a Sutherland Medal. After consulting with the Academy of Science and ANZAAS this initiative was adopted and the KL Sutherland Memorial Medal was established in 1982 by the Australian Industrial Research Group, the Australasian Institute of Mining and Metallurgy and the Australian Academy of Technological Sciences and Engineering. The Medal is awarded biennially to persons of outstanding achievement in the application of science for technological purposes and the benefit of the community. Director, National Association of Testing Authorities.